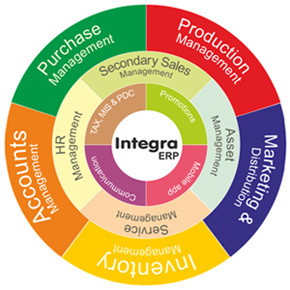 Integra ERP - Production is proven software for manufacturers of deferent verticals in small and medium segment. It is an advanced purpose-built solution by which companies can manage their complete operations, from raw material procurement to finished goods despatching. Integra ERP provides material planning and cost control mechanism, easy production lining for semi finished and final product. Row material stock and costing will automatically affect as per the standard consumption ratio when entering a production voucher. Each production line costing is most important factor for the manufacturing companies due to process involves various functionalities that incurring additional cost in each stage. After each stage of production line, deriving a semi finished product or a working progress with added cost of consumables and factory overheads, hence will reach the final product and its cost of production without any manual costing calculation. More over each production stage raw material related to the product automatically updating stock and any time stock position in raw material storage will be correct.